This book is for anyone grappling with the immense questions of how to prepare communities to flourish despite unprecedented climate impacts. It offers insights into new approaches to design, engineering, and planning, envisioning adaptive and resilient futures for coastal areas. 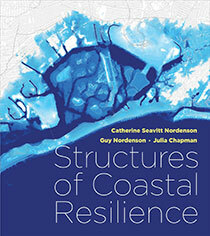 "A significant contribution to the body of research on coastal resilience...Structures of Coastal Resilience is an excellent collation of current design research and trends related to our coasts. And through historical analysis, ecological research, and an exploration of representation, the book suggests new ways of seeing and responding to the opportunities our coasts provide." "Structures of Coastal Resilience proposes a dissolution of the boundaries between engineering, architecture, and the sciences in favor of a climate-responsive environmental design approach, integrating broad-scale material transformation, micro-gradients, people, and marine life. Case studies of action and intervention are presented alongside thoughtful commentary exploring the designer's expanded scope and agency within an increasingly dynamic coastal edge. A must-read!" "The coast—the great meeting of land and water, familiar, strange, beautiful, frightening—a place we abuse and build over, yet where nature remains wild and uncontrolled. With vivid visualizations, Structures of Coastal Resilience captures these dichotomies and points us toward a new relationship with the coast, a necessity as rising seas threaten to overwhelm us." "With more than half of the world's population residing in coastal cities, this book presents a much-needed action plan—a manifesto for urban resilience. Interweaving historical observation with a scientific analysis of natural processes at play in the landscape, the authors present a new paradigm of design that can adapt to the trajectories of climate change and coastal flooding. Here, the physical infrastructures of defense give way to the flexible and adaptive strategies of ecology, policy, and planning."